JNH Lifestyles’ mission is to help their customers improve their lives. They want their customers to achieve their needs and aspirations through healthy living with the means of their saunas. The many benefits such as better sleep, detoxify, weight loss, or just mere relaxation can be achieved through the use of saunas. JNH Lifestyles pushes their customers closer to their goals with their accessible and affordable products. This compilation of JNH Sauna reviews will help you decide on which is sauna is suited for you. It focuses on each of the sauna’s specifications and people capacity. Joyous is a carbon fiber sauna that is equipped with heat retaining insulation. It’s a modern type of sauna that is good for one person only. If you need a straightforward infrared sauna with advanced features, then Joyous sauna by JNH Lifestyles is an excellent choice. People say this is a good sauna for those looking to reduce their blood pressure, as well as improve skin condition. In addition, people are happy with the sauna’s 5-year warranty policy. A separate digital control for the temperature and time you want to use the sauna. This is a double layer wood sauna made from 100% Canadian Hemlock. No chemicals added. It can heat up to 60-degree Celsius or 140-degree Fahrenheit. It takes around 15 minutes to warm up the sauna. A professional electrician is required for the installation. This is a limited edition far infrared sauna that emits no EMF. Made from Canadian Hemlock wood, this sauna is certified to be 100% natural. This means no chemical is added to enhance the appearance of wood. People are impressed with the product’s construction, complimenting it as one of the best JNH saunas for single use. Made from 100% Canadian Hemlock, a wood known to be a great softwood alternative for hardwood material. It also has a digital control panel that you can use to adjust the sauna temperature and the duration you want to use the sauna. You need to hire an expert for the assembly. The NE2HB1 sauna from JNH Lifestyles is the perfect saunas for couples as it can seat up to 2 people inside. 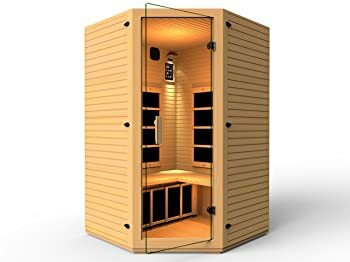 This is also a modern far infrared sauna with no EMF radiation. Instead of 6 carbon fiber, this one has 7 carbon fiber heaters that are strategically placed to give you a well-rounded heat in the sauna. “Excellent value” and “high-quality” are words and praises from those who have tried using this sauna. They commend the sauna’s quality and are happy with its overall performance. Made from double layer 100% Canadian Hemlock wood. This type of wood can retain heat well but doesn’t cost you an arm and a leg. You’ll get 3 years of residential warranty and a lifetime technical support from the JNH team. Only delivers curbside, so you need to arrange someone to help you unload and take it inside your home. The installation is a bit complicated; hire a professional to do this job. This size of this sauna is convenient for houses with limited space. Its 7 Carbon Fiber FAR Infrared heaters are situated on the back panels, side panels, and under the bench. It also comes with control of how hot the sauna you would like to be or how long the session would last. Customers said the product was easy to assemble and addictive to use. Customers praised its quality and performance as being the best infrared sauna at a reasonable price. This product had the most positive infrared sauna reviews. It is easy to assemble, taking about 1-2 hours to unpack and assemble. The heat is maximized even with the small size of the sauna. It cannot be used outdoors. It is not recommended to clean with strong liquid cleaners. The capacity depends on size and space of people using the sauna. The sauna has not been weight tested, so the weight capacity is unknown. This sauna is convenient for homes with limited spaces. It is equipped with 7 Commercial grade Carbon Fiber FAR Infrared heaters and structure made of 100% Canadian timber. It comes with an LED digital control panel to easily control the length and temperature when the sauna is in use. The delivery was quick, and the assembly was very easy. It heated up quickly and did not heat the air like other conventional types (water, rock, or steam) of the sauna. The sauna comes with built-in AUX control, 2 premium speakers, volume rocker, and LED lighting. It can fit into tight spaces. The capacity depends on the size and space occupied by of the users. This 3-person sauna comes with 8 Carbon Fiber FAR Infrared heaters and a built-in thermostat. The highest temperature it can achieve is at 140 degrees Fahrenheit and a minimum of 90 degrees Fahrenheit. Customers found assembling it was easy. The sauna heated up fairly fast and provided a good user experience. It only takes 10 minutes to heat up. The speakers are only accessible from the inside. 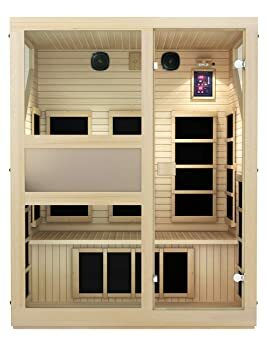 This sauna has many features such as 8 Commercial grade Carbon Fiber FAR Infrared heaters with optimized position, best insulation due to its double layer 100% Canadian timber, premium sound equipment, and LED control panel. Customers were pleased with its quality, from assembly to user experience. The temperature and duration of the session can be controlled. Weighing at 254 lb, it is considered fairly light. The sauna cannot be used for outside use. If you fancy a more stylish looking home sauna, then this is a sauna for you. This far infrared sauna can accommodate up to three people. It uses carbon fiber for its heater, which is best in producing and retaining heat inside. Users of this sauna love the fact that this sauna fits in the corner of the room. Its design is also awesome with tempered glass door and windows that people agree it suits well in modern homes. This is an ETL and UL approved product, so when it comes to safety, you’ll surely have a peace of mind. Its features include 2 built-in speakers with AUX control, benches, and digital control for temperature. The carbon fibers used in this sauna are 100% premium quality, as well as the Canadian Hemlock wood material which has no chemical added. It takes a while to completely heat up, approximately 1 degree per minute. A beautiful sauna with advanced features is the best description for this product. JNH Lifestyles are proud to present 3-person sauna that uses 8 carbon fiber heaters. This is a sauna for a family of 3, which is worth the investment. The heating panels work magic, making you swear just a few minutes in the sauna. You’ll have better visibility inside the sauna. This sauna’s main feature is its maximum 4 people capacity. It comes with 8 Carbon Fiber FAR Infrared heaters with the best insulation provided by Canadian timber. Although, this had the least infrared sauna reviews. The sauna was simple to put together but the needed help of another person. The product delivered good quality. It can possibly accommodate more than four people, depending on size and space. It has amazing features paired with its large capacity. Takes up much space and heavy with its weight at almost 400 lb. You need two people to assemble the sauna. Consider the size and space where you plan to install the sauna. If your house is spacious, you can opt for a bigger sauna. If your house has limited space, you can opt for a smaller, space-saving sauna. Saunas require maintenance and cleaning as it involves sweat discharging from the user’s body. An easy to clean sauna is one feature that you need to consider. Review the specifications of the product you are eyeing to see which product suits you and your needs best. Look at the products that are within your budget range. There are products that do not sacrifice good quality at an affordable price. Overall, JNH Lifestyles have a wide array of saunas to choose from, offering different styles and designs, but never sacrificing its quality and convenience. The variety of its products helps customers narrow down their search for the sauna suited to their needs and lifestyle. Moreover, JNH Lifestyles provides good quality saunas at an affordable price. Anyone’s goal of healthy living that the sauna can provide is within reach with their products. Our JNH Sauna reviews conclude that the Ensi 3 Person FAR Infrared Sauna is the best infrared sauna among the five. 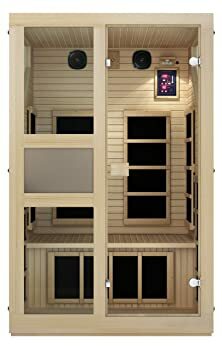 It is reviewed to be the best due to its many features such as 8 heaters, double layer timber, sound experience, LED control pad— all encompassing in a sauna that is neither too big nor too small. 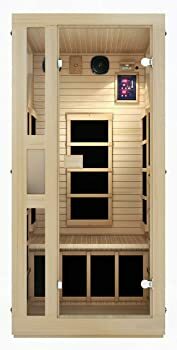 It matches the features of the Joyous 4 Person FAR Infrared Sauna without the intimidating size.